William Wentworth, was born in Thame in 1890, one of three children of Henry and Mary Wentworth. In 1911 he was living with his mother and stepfather in Southern Road, Thame and was a cattleman on a farm. Later in the year he enlisted with the Grenadier Guards (Service No. 15491). 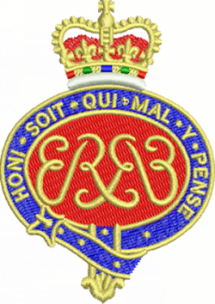 His battalion, the 3rd, was stationed at Wellington Barracks in London at the start of the war, until they were mobilised, and embarked at Southampton on the Clyde Steamboat “Queen Alexandra” landing in Le Havre on the 27th July 1915. He was wounded during the “Battle of Flers–Courcelette” on the Somme in September 1916, and in 1917 he won the Military Medal, most likely during the Battle of Pilckem Ridge. 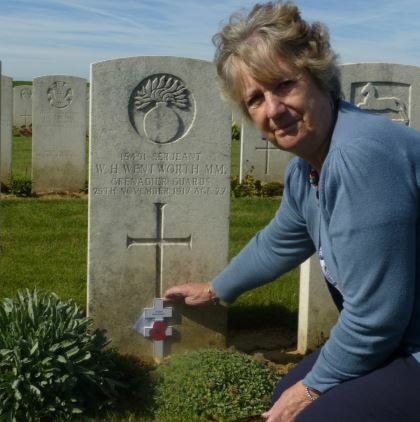 Sergeant William Henry Wentworth died of wounds at No 21 Casualty Clearing Station, Ytres, approximately 20 miles southeast of Arras, on 28th November 1917. He had received his wounds the previous day when his unit the 3rd Battalion Grenadier Guards attacked the village of Fontaine Notre Dame during the 1st Battle of Cambrai. He is buried in Rocquigny-Equancourt Road British Cemetery, Manancourt, Somme France and in Thame he is remembered on the town war memorial and the All Saints church memorial board.